Spiritual grounding is very important for everyone, but especially critical if you have been doing spiritual development or psychic work. Being ungrounded is unnecessary and is totally preventable. So what action could you take to ensure you stay grounded and healthy? Whenever possible, walk barefoot on the earth in a garden or park, or go for a barefoot walk on a beach, to achieve earthing. Emotional grounding is important, and walking in the water will aid your emotional body as well. As you do this, you release energy from your body, and it is transformed into earth energy when you discharge it into the earth below your feet. When you are not able to get outside or ground yourself to the earth for any reason, do a grounding meditation. 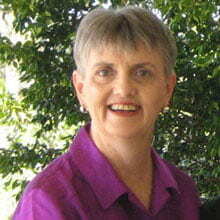 Relaxing...centering... grounding... very important actions for your overall well-being. Go within, become centered, then follow through with the visualization in the following grounding meditation. 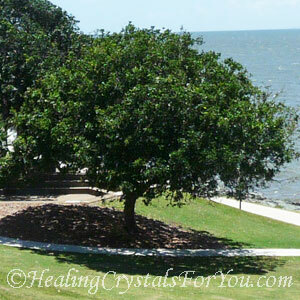 A most effective grounding meditation involves using visualization, to assist you with spiritual grounding. Sit down in a chair in a relaxed position. It is best done with bare feet that you place flat on the floor, so that you are can feel as connected to the earth as possible. As you close your eyes, begin by mentally drawing a line from the bottom of your feet down into the earth. Visualize a spot about twelve inches below the sole of each foot. Imagine that you can feel any excess energy you may have in your body moving down your legs, and moving out of your body into the earth. Now I want you to imagine that you are a tree, a beautiful tall, healthy tree. Feel roots descending from the soles of your feet, as you send them down, deep into the earth. You go deeper and deeper into the cool moist earth, and as you do you begin to take nourishment from it. You feel your roots growing stronger and you feel your life-force energy deepening and strengthening. You feel a surge of love and gratitude from Mother Gaia come up through your roots and into the soles of your feet and up into your body. This love and gratitude is for the gift of energy you have given to her. You spread your arms above your head, and visualize that these are your branches. You feel leaves growing on your branches, strong, healthy and vibrant. Your branches reach high into the sky, enjoying the warmth of the sun on the leaves, or the coolness of the moon. You reach up to make contact with spirit, and gather the energy from the Divine Source and allow it to energize and nourish you. You have had your fill so you allow the balance of the vibrations from the higher realms to make its way down your body, and slowly filter down your legs. As you allow this energy to flow out of the soles of your feet, you give thanks for the gift you have been given. You feel gratitude to Spirit for the gift you have been given, and you thank Mother Gaia for all she does for you. As you give her this gift of your body's excess energy, to be transformed into earth energy. When you are ready you slowly open your eyes. You know that you can come here as often as you like and do a spiritual grounding, and that the earth will enjoy the gift you give her of your excess energy. 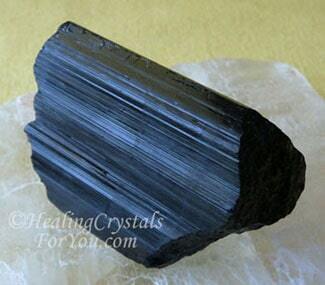 You may like to use Black Kyanite first, shown in the image on the right, before you use any other stones, as it is extremely helpful for grounding. 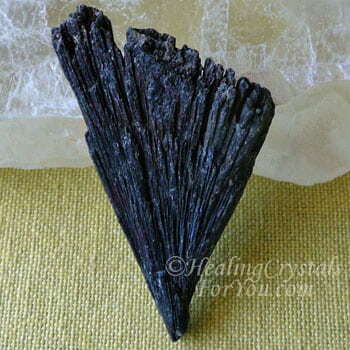 Black Kyanite is highly recommended when doing spiritual grounding, but any color of this stone will help you. All colors of Kyanite have the added advantage of aligning your chakras. Most grounding stones are earth star chakra stones, but you also may find helpful stones among the base or root chakra stones. 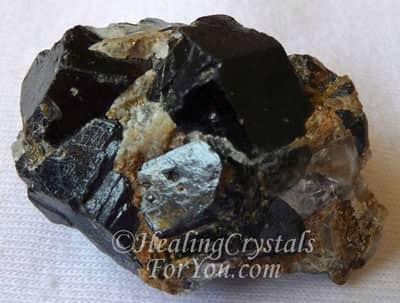 For grounding and protection, many of the black gemstones and crystals are highly beneficial. So which stones should you use? Have you seen the list of grounding stones? Take a look at the stones mentioned in the Frequently Asked Questions below. Check out the chart and list on the next page, to discover more about the best and strongest stones for grounding, as many stones listed there are easily obtained. Are you ungrounded? Do you know the symptoms of being ungrounded? Have you heard of Earthing, and the book written by Clint Ober? If you are ungrounded earthing yourself is highly beneficial. What are the best and strongest grounding stones? Check out the in-depth list of grounding stones. Did you know that there are a large number of crystals that will ground you. Maybe you already have some stones that you did not know could ground you? Read about wearing grounding stones and how this could benefit you.